Two Boston-based food startups are making it even easier to eat locally sourced, sustainable food from the comfort of your own kitchen. Getting into the kitchen should be a noble cause: a way to reconnect with what you consume, to learn how to use seasonal ingredients, to save money. Or is it? Startup culture is all over that game, even if they seem to lose sight of those wholesome goals along the way. The new favorite foodie fad is the cook-a-box model: customer picks some recipes online from x company’s website. X company sends them a box of ingredients, all pre-chopped and measured, and customer gets to do the fun part — the cooking. But in the age of food-miles and sustainability, how do you know what you’re eating is fresh, let alone local? For places like Blue Apron or HelloFresh, who FedEx their food from New York, that’s not really the point. They’re interested in bringing the fun back to cooking — but no one’s thinking about the consequences: pounds of trash created from the packaging, and gallons of gas wasted for the sake of convenience. For the environmentally conscious, most cook-your-own meal kits are problematic, and many locavores have opted out. Luckily, Massachusetts has a few options for those interested in cooking — or eating — sustainable food on demand. For those who like meal delivery for the convenience, Somerville’s local-eating pioneer, JJ Gonson, has options available — but they’re not for the DIY-crowd. 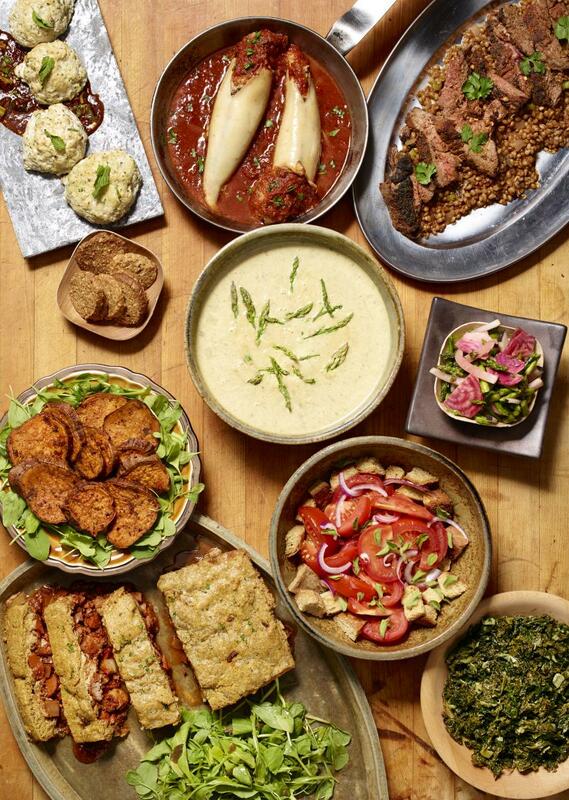 Gonson, who founded one of the first 100 percent local food businesses in Massachusetts, offers food delivery through her catering company, Cuisine En Locale – centered around packages of fresh meals, already prepared, with completely local ingredients. But to her, the fact that the meal is completely cooked is key to her brand. She’s serving the folks who are too exhausted to cook, but still care about what they’re eating. Starting at $85 for four meals, these fully-cooked dinners are comparable, price-wise, to high-end takeout -- around $21 per meal. So how does the conscious cook coexist with the convenience cook? The mileage of cook-a-box businesses are drastically higher than getting those ingredients yourself — double the shipping, for the ingredients to get to the prep site, and then to your door. But those gas-guzzling businesses are tantalizing time-saving, and addictively fun. Enter the Boston-based alternative, churning out recipe components from its Dorchester headquarters. Just Add Cooking was packing those boxes before word got out about the big meal delivery services. Three years ago, Anders Lindell and Jan Leife decided to bring a Scandinavian business to US soil (these cooking boxes were already popular in their native Sweden), but it wasn’t just about cooking convenience. The two knew sustainability and locality had to be key to the business — so they started working with local farms. Let’s say you want to use Just Add Cooking. You’ll go to their website, pick the ideal plan (two-person or four-person boxes), pick a delivery day, and wait. The JAC team will pack up your box with fresh ingredients in the morning, and ship the food out that day using a local courier. You’ll get completely recyclable or compostable packaging filled with local ingredients, for recipes designed by local chefs (Jason Bond, anyone?). That cuts down your food mileage, while keeping all the convenience of out-of-town competitors. O’Neall, a 30-year-old cyclist and former teacher, began packing boxes with Just Add Cooking two years ago as a favor for a friend. Now, he serves as the face of the business time and time again. He likes that the business not only connects locals to their food, but also teaches home cooks how to use local ingredients. Instead, Just Add Cooking develops recipes that teach you how to use those fiddleheads and oyster mushrooms to make tacos or gnocchi. And the benefits of staying local go beyond the ingredients: Once, when a customer missed delivery day, O’Neall strapped a box to his back and biked to Charlestown so she could cook dinner the next night. Plus, shorter travel distance means less overhead: Three meals for two people is just a few bucks. $39 for first-time customers, bumping up to $69 after your first meal. That’s only about $11 a meal at regular price, but remember: the cooking’s up to you. Getting back to your kitchen — and eating local — really are noble causes. These hyper-local food startups can help make it easier.